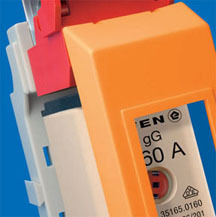 Based on its traditional core competence EFEN offers a complete system of state-of the-art NH Fuse-Links. The Fuse-Links are nationally and internationally certified for various nominal voltages. The characteristic curves comply with VDE/IEC requirements, e.g. for gG cable and line protection, for gTr transformer protection, for gR/aR semiconductor protection. A wide range of accessories and versions complement the system, e.g. strikers, battery fuses and maintenance-work fuses with special current limitation and many more. The EFEN product range offers a wide variety of solutions for virtually any application and for very specific requirements. NH Fuse-Bases are designed for the easy and low-cost integration of NH Fuse-Links into distribution systems. For this purpose, EFEN offers systems suitable for baseplate, rail-mounting and for 60 mm busbar systems. 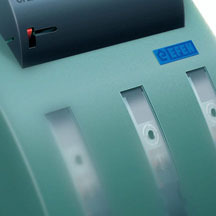 The single- and triple-pole devices feature several connection options. EFEN NH Fuse-Bases can also be used for fuses with higher power dissipation such as NH Fuse-Links for the protection of semi conductors gR/aR. The EFEN product range is complemented by special designs e.g. 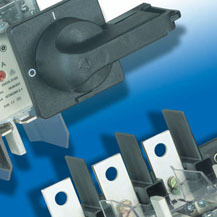 for AC 1500 Volt Fuse-Links and by a comprehensive scope of accessories for various connection types, dividing walls, contact covers, fuse covers and many more. This product range was taken over from Peterreins in 2003 and has since then been successfully continued by EFEN. The switching devices feature a superb functionality and are available in many sizes and versions. For example, there are Load-Break Switch versions for NH Fuse-Links acc. to DIN standard and also for NH Fuse-Links acc. to BS standard. The wide range of FMU Load-Break Switches includes 3- and 4-pole versions as well as Bypass versions with dual switch mechanisms, i.e. 6 or 8 poles that are switched simultaneously. The devices have important system benefits, are of a rugged design and are frequently used for construction site power distribution, grid and back-up feed systems, railroad and utility applications, telecommunication and broadcasting systems, hospitals, airports and transport providers. The Fuse-Switches NT-IN are the result of year-long experience and provide sophisticated technical solutions for all applications: The coordinated switching devices are available as an extensive and flexible system. Ease of installation has been a key requirement for the development of the system and its accessories. 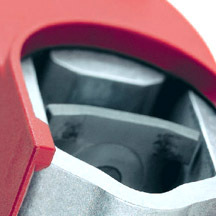 The system’s appealing style enhances the appearance of a well-planned distribution system using EFEN products. The EFEN-NT-IN line is nationally and internationally approved. In addition to the standard sight windows for quick voltage checking, blown-fuse monitoring devices and switch-position indicators are available. A broad range of user-oriented solutions make EFEN-NT-IN one of the most comprehensive product lines on the market. The NT-SILAS series offers plant designers and cabinet builders yet another EFEN system of reliable and easy-to- install switching devices: This modular system has been developed on the basis of intensive market research. NT-SILAS devices are nationally and internationally approved. 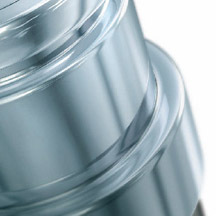 NT-SILAS products feature innovative solutions frequently requested by clients: Full covers are easily removed with the actual switch cover remaining closed. Thus, there is no need for frames and extensions. 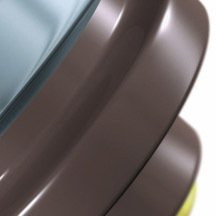 SILAS products are touch-protected, and their sliding sight windows allow voltage checks at the contact blades and gripping lugs of the NH Fuse-Links. 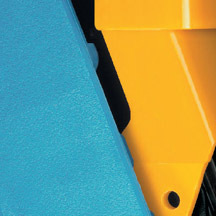 Another unique feature is the patented system for the conversion of the upper and lower wiring outlets. EFEN offers four product lines of vertical NH Fuse-Switches that have been developed for different purposes. The IN Fuse-Switches –vertical design are available in two versions. One version allows the direct contacting on a 60 mm busbar system. The other version is designed for direct contacting on 100 mm and, using an adapter, 185 mm busbar systems. The proven NTSL product line is the right choice when extraordinary mechanical and thermal stability are required for highly demanding distribution systems. The product line R2000 is characterized by completely unified dimensions in the sizes 1 to 3 and a modern design. It also includes a well-adjustable size 00. The wiring connection spaces are especially generous. The EKDEO line particularly meets the requirements of power utility applications. The low-profile devices allow installation even in cabinets with little depth. All systems are designed for quick installation and are nationally and internationally approved. The many options and user oriented versions make the EFEN NH Fuse-Switches –vertical design one of the most comprehensive systems on the market. We will assist you in finding optimal solutions for any application. 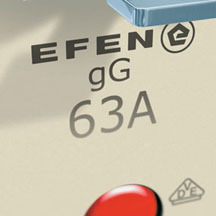 To make work easier: EFEN offers a wide range of accessories for Fuse-Links and Fuse-Switches. As a one-stop source of Fuse-Switches and Fuse-Links as well as specific components, EFEN provides solutions for special requirements. The EFEN system comprises complete ranges from window type current transformers for power rails in all sizes, Tube-Type Transformers with wiring window (also for installation behind NH Fuse-Switches – vertical design and NH Fuse-Rails), to wound and summary current transformers. For NH Fuse-Switches –vertical design, transformer sets and blocks for single and three-phase measurements are available. The range of high-quality devices in all rating classes facilitates even complex installations to be equipped with components of one single system. The EFEN system is characterized by accuracies of up to class 0.2s, depending on the type. Calibration or calibration suitability Current transformers are available. EFEN offers two lines of surge arrestors with nominal discharge currents from 5 kA to 10 kA for overhead-line grids. The devices are equipped with metal-oxide varistors in robust and aging-resistant ceramic housings. They respond within nanoseconds and with low residual voltages. This ensures a high level of surge protection. Triggered surge arrestors are easily identified by the catch cable. EFEN surge arrestors are available as insulated and uninsulated versions for various mounting types and terminals. The range of general purpose and back-up Fuse-Links for nominal voltages from 3.0 kV to 40.5 kV is derived from the core competence of EFEN. All products are nationally and internationally approved. These Fuse-Links allow for reliable protection for transformers, condensers and engines. They range from versions for indoor and outdoor to oil-submerged applications. EFEN HH Fuse-Links are designed to limit currents within milliseconds, thus attenuating the peak value of the sine-shape current curve. The ÜLA product line controls the power dissipation of the fuse within the Fuse-Link compartments of control systems. EFEN offers a wide range of accessories for HH Fuse-Links, but also special product variants and qualified support in all matters concerning applications. 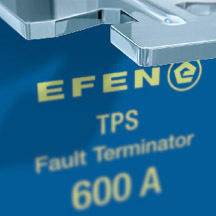 The EFEN-TPS Fuse-Switches are developed particularly for power systems of up to 80 Volt DC and have significant benefits. Their special DC Fuse-Links have a very high energy density which results in a compact design. This saves space and cost when installing power distribution systems. Signal monitoring devices with switch-position indicators, fuse bases and distributor modules are available for the complete product range. TPS disconnectors are used to protect DC distribution system, e.g. in telecommunications power-supply systems. Please contact EFEN for support in selecting the right devices and protection systems. For uninterrupted power supplies, EFEN offers a complete range of single-pole compact Load-Break Switches which are specifically designed for 550 Volt DC operating voltage. The Load Break Switches are used to protect batteries and battery-supplied circuits, they define purposes. Fuse-monitoring devices, signaling devices and a multitude of accessories are available. The short-circuit disconnection of a battery system must be precisely tuned to its capacity and service concept. 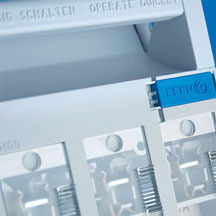 Battery-Fuses selected in coordination with EFEN ensure reliable protection. For additional information on Efen Fuses contact us at 918.665.6888, or use our fuse search tab at the top of the page. 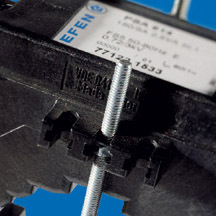 You can also request a quote on any of the Efen Fuses using our quote form.